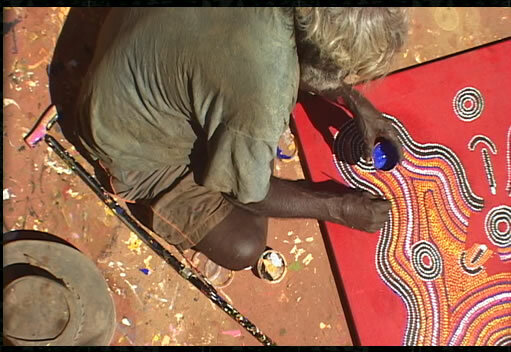 Elder Aboriginal artists pass down their history and culture through their paintings. Singing the Milky Way follows 90 year old Australian Aboriginal elder and internationally acclaimed fine artist, Paddy Japaljarri Sims, his fellow artists, family, and friends, on an emotional journey ‘out bush’ to reconnect with their hunter-gatherer roots and the source of their spiritual and artistic inspiration. The artists perform songs and dances beneath the haunting rock formations of Paddy’s sacred sites, illustrating their visceral connection to the land and the natural cycles, which provokes a flood of memory — of life in the bush — and how they lost it. The film is firmly anchored in Aboriginal voice, seamlessly alternating between the time before white people came, the mythological past, and the historical present. Paddy recounts his first contact with missionaries, who lured him into mission life in the 1930’s with the promise of food and clothes and put him to work digging wells and building fences. He tells of his involvement in the famous Yuendumu School Doors project (the doors are currently on an extensive European museum tour), which both sparked the contemporary painting movement and proved the validity of expressing Dreamings (creation mythologies which form the underpinning of Aboriginal life) in new ways to insure their culture’s survival. Paddy also tells of his journey to Paris to install a ceremonial style ground painting in the Centre Pompidou for the 1989 exhibition, ‘les Magiciens de la Terre’. Singing the Milky Way explores the convergence between modern art and ancient Dreamings, between the personal and the universal. As Paddy Sims’ and his ‘mob’ journey through the sand hills, salt flats, and majestic rock formations of his traditional country, the artists set to work - in parallel time - on an epic canvas of the Milky Way Dreaming. As the bush trip progresses, still photographs and archival footage elicit Paddy’s remarkable life story, and body of work. At the end of the bush trip, while performing songs from the Dreaming, Paddy’s voice falters. He drops his boomerangs mid-clack. Breaking down in tears, he remembers his vanished Japaljarri brothers — the hunter-gatherers with whom he once wandered this hauntingly beautiful landscape — leaving this venerable elder, the last of his lineage. Paddy Japaljarri Sims’ emblematic life — and the brilliant painting he completed for the cameras, Yiwarra, Milky Way Dreaming — illuminates the world as aboriginal elders see it — through the lens of the Dreaming. To these artists a painting on canvas is not merely an object of aesthetic beauty, it’s a cultural document signifying far more: a ritual template, a map, a deed, an assertion of land rights, a record of a vanishing way of life, a means of keeping that past alive, and a new way of handing down age-old traditions to future generations. Singing the Milky Waytakes viewers on an epic journey through the bush exploring the worldview underlying Aboriginal paintings and the struggle of this last bush-reared generation to keep their cultural patrimony alive and to define themselves in a more complex and perilous world.s world peace and raises funds to benefit humanitarian causes.